A Juul e-cigarette for sale at Fast Eddie&apos;s Smoke Shop. Shoppers must be 21 years of age. A new front has opened in the never-ending game of cat and mouse between teenagers and adults — over Juuling, a discreet form of vaping that is the most widespread phenomenon you’ve likely never heard of. In some high schools, the “Juuling in the bathroom” problem has gotten so intense that administrators are sending home e-mails warning parents about the dangers of e-cigarettes in general — and, in particular, about a brand called Juul, which makes sleek devices that are easily concealed and often mistaken for thumb drives. 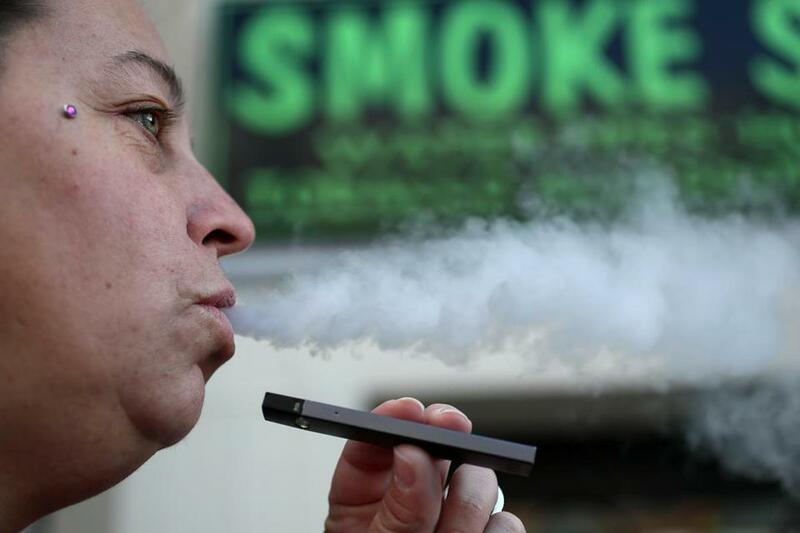 A psychologist who sees patients in Boston’s upscale western suburbs told the Globe that every teen he treats now uses a Juul. One patient, a student at a prestigious local private school, secretly used his parents’ credit cards to buy thousands of dollars of Juuls online, and then turned around and sold the devices and flavored pods to other kids at a profit. He was eventually expelled, said the therapist, who requested anonymity to protect his patients’ privacy. Beyond the fact it can get them in trouble, many kids think there’s nothing wrong with vaping or using a Juul. But John Ross, a hospitalist at Brigham and Women’s Hospital who contributes to the Harvard Health Blog, said long-term safety data on e-cigarettes do not yet exist. A banner across the top of the website clearly states that its products are for those 21 and older, and would-be purchasers are alerted that an adult must sign for delivery. Juul pods come in kid-friendly flavors, but in a statement e-mailed to the Globe, the company emphasized its position that its products are intended for those 21 and older. “JUUL Lab’s mission is to eliminate cigarette smoking by offering existing adult smokers with a better alternative to combustible cigarettes,” the statement read. “We strongly condemn the use of our product by minors, and it is in fact illegal to sell our product to minors. No student at any high school should be in the possession of a Juul product. Even so, kids are managing to score what they need — one high schooler says Juul starter kits can be purchased on the resale market for around $80. Students are Juuling in the boys and girls rooms, hallways, and even in class, where they take a hit and then swallow the vapor or exhale it into their hoodies when the teacher isn’t looking. Although many parents have never, or only recently, heard of Juuling, every student approached by a Globe reporter in multiple suburbs not only was familiar with the product, but had a story. A Juul e-cigarette for sale at Fast Eddie's Smoke Shop, demonstrated by shop manager Cathleen McCarthy. Shoppers must be 21 years of age. “In history class today, a kid pulled something out of his pocket and a Juul fell out,” said a junior girl in Needham. It was the same deal in Newton. “People are [openly] charging them at school,” said a freshman girl hanging out at Rancatore’s ice cream after school. “On Snapchat, I’ve seen people Juuling in class,” said her friend. 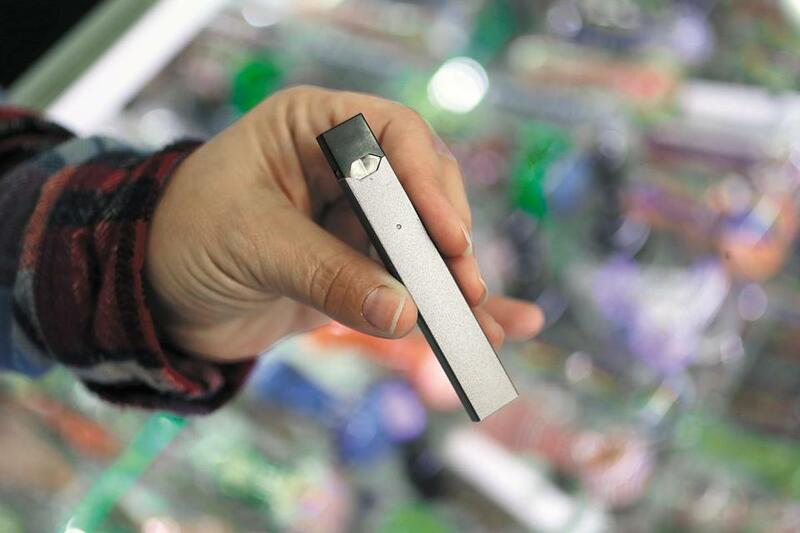 He described the challenges of catching a student in the act: Because Juul pods come in flavors (including mango and crème brulee), the sweet odor “can almost be attributed to a light perfume,” Sicotte said. The school is planning an educational night in March for parents, and in the meantime, officials have increased monitoring of bathrooms. In Braintree, Juuling has gotten so popular that two broadcast journalism students made a news-style video about it, complete with a female Juuler whose voice is changed to conceal her identity as she describes where she partakes. Like a lot of teenagers, Emily Linskey — the video’s cocreator and on-screen reporter — was surprised to learn that Juuls contain so much nicotine. Meanwhile, even as kids are Juuling to be cool, doing it the wrong way can backfire, at least that’s the word from two Needham High athletes. Seniors confident in their social rank, they sat parked outside the school and criticized freshmen who are so inexperienced they huddle around a Juul and then try to look innocent when someone walks in on the action.